Disney originally planned to release the trailer for Moana earlier in the day yesterday (and actually did for a brief time before removing it), but decided to hold off until the evening out of respect for the horrific shooting in Orlando. The actual debut of the trailer coincided with a commercial during the Tony Awards, which were fantastic and a cathartic way to finish an emotional day, so we can finally dive in to this much-anticipated next offering from Disney Animation, due out in November 2016. 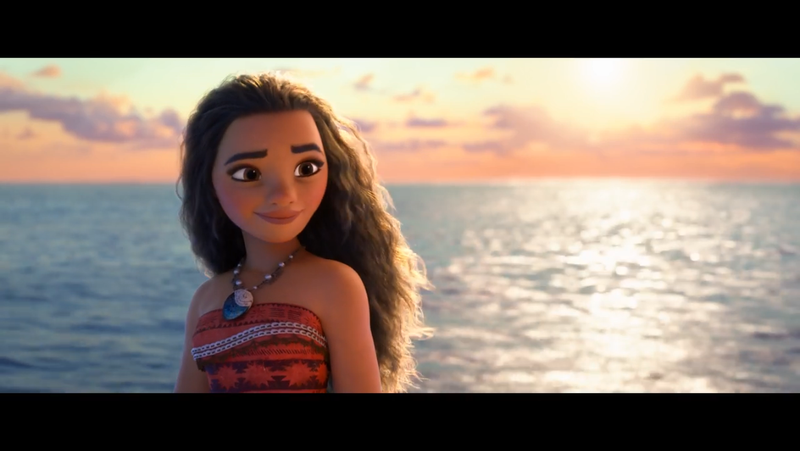 Disney already has one animated smash hit this year with Zootopia, and the excitement around Moana could spell another hit for a studio that has been on a roll lately. (Seriously, with Wreck-It Ralph, Frozen, Big Hero 6, and Zootopia, this has been an excellent stretch for Disney Animation.) So take a look at the gorgeous trailer below and then read on for my thoughts and screencaps, and then tell me what you think! 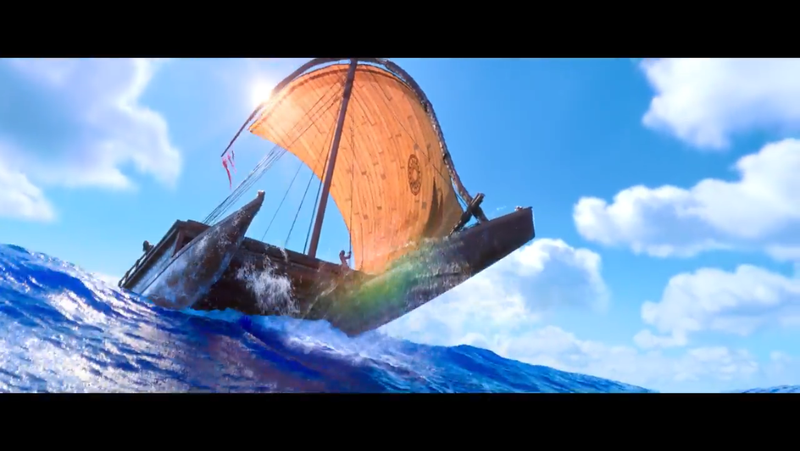 This first teaser trailer doesn’t give us a big glimpse at Moana’s story, nor much of the title character herself, but it does give us a feel for the look and style of the film, as well as a healthy dose of Maui, the demi-god voiced by Dwayne Johnson, and a little taste of the music. 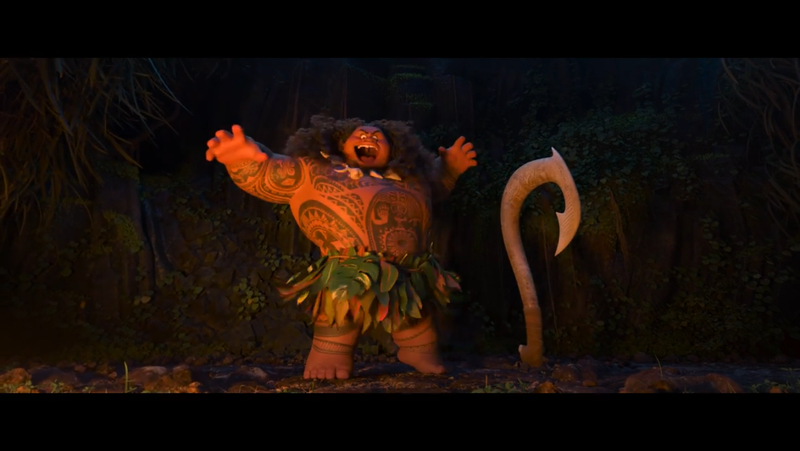 Only for the camera to zoom out as we realize we’ve actually been watching Maui’s living tattoos tell the story, threatening to upstage the real Maui until he gets them to calm down. I love the “tattoos with a mind of their own” idea, especially since they’re animated by Disney legend Eric Goldberg (who brought the Genie to life in Aladdin). 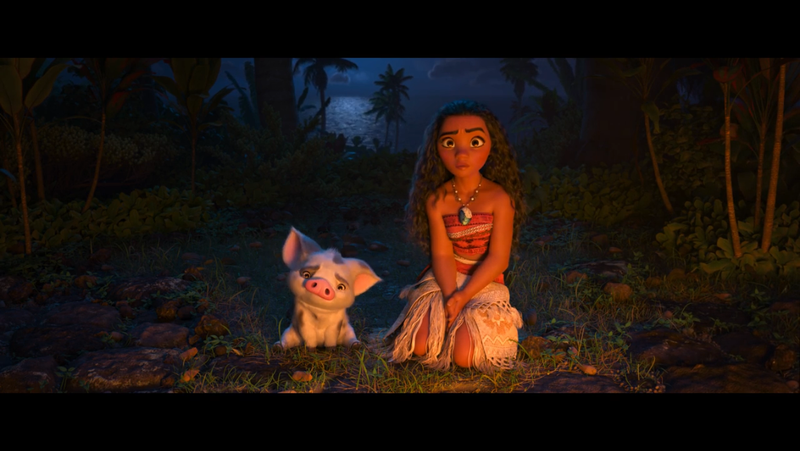 But Moana is decidedly not impressed, while Pua the pig just looks confused. “Nothing? Really? What’s a demi-god gotta do?” Ok, a few things here. 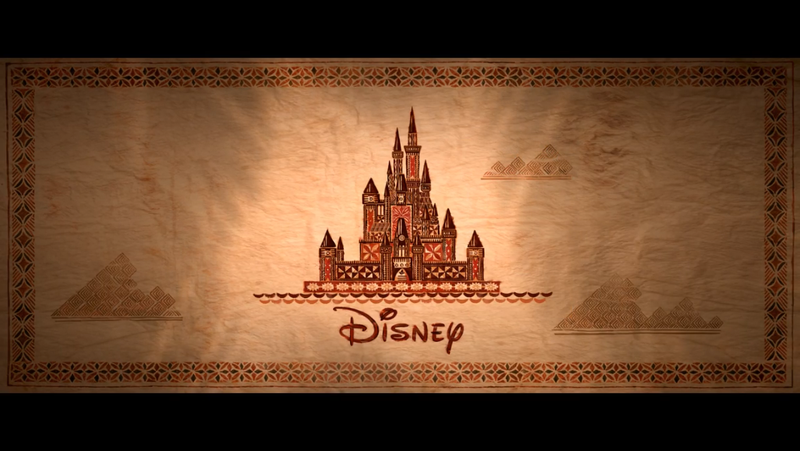 First, this was one of two sequences shown at last year’s D23 Expo (we’ll get to the 2nd in a minute), and it was a hit. Second, Dwayne Johnson is perfectly cast for this film and this role. 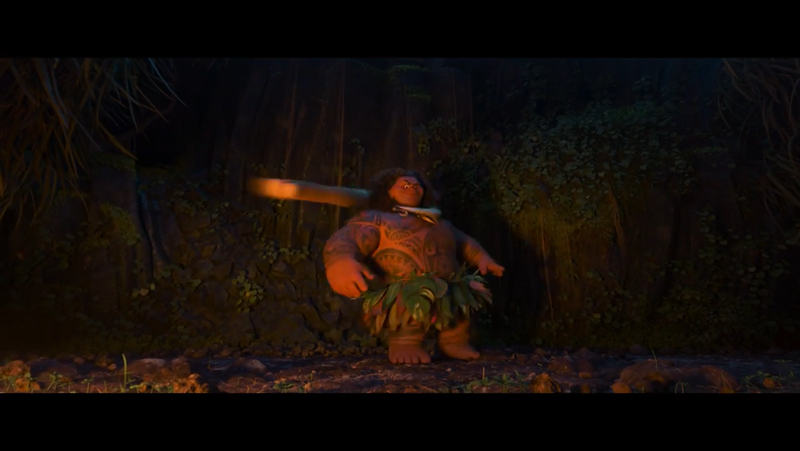 Most importantly is the fact that Johnson is of Samoan ancestry, an important step by Disney towards including the correct representation among the cast with regards to the culture depicted in the film. But also, Johnson has just the right level of charm and swagger to play a demi-god (and charm everyone while onstage at the Expo), but also a willingness to be self-depreciating as we’ve seen in many of his movies. For a wrestler he’s actually an excellent actor, particularly when it comes to comedy, and he has an understanding of how to subvert the expectations that go along with his image for the maximum amount of humor. Third, how adorable is Pua? Just look at that face! 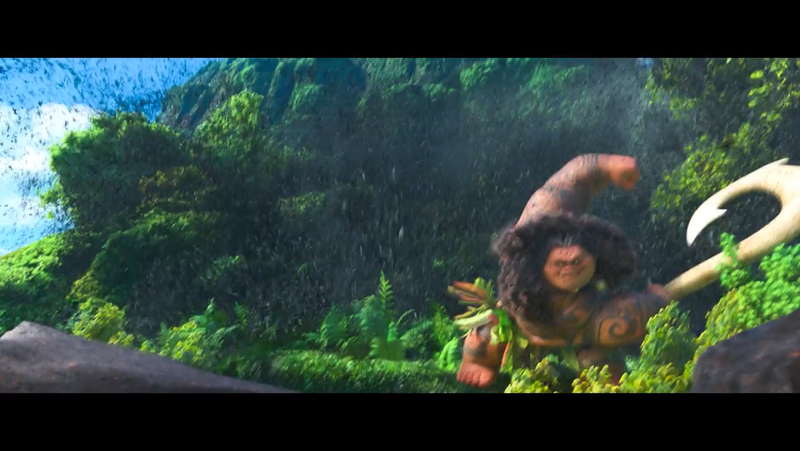 First up is Maui, whom we’ve already seen, obviously, and who is really working the eyebrows. 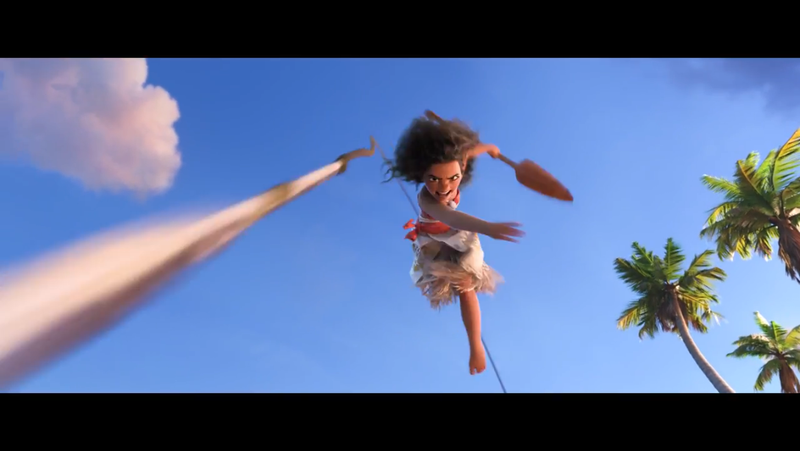 Then we get to see a bit more of Moana, who is both beautiful and fierce, throwing a harpoon like a badass. 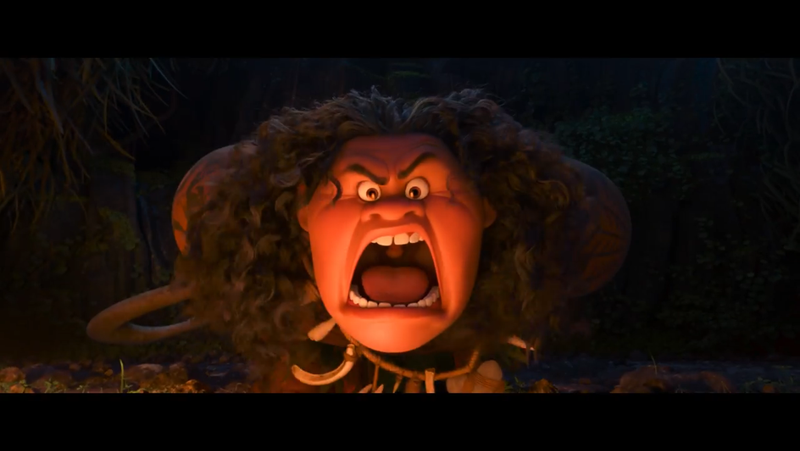 Though we don’t get to hear anything from newcomer Auli’i Cravalho, who will be voicing Moana. We then get what is perhaps the most important information in the trailer, at least in terms of building excitement among the masses. 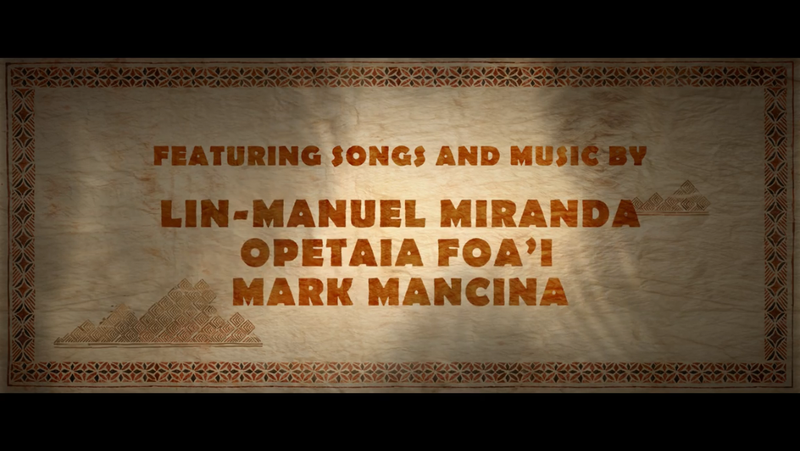 Most people probably don’t know Opetaia Foa’i (of the band Te Vaka), or Mark Mancina, but they sure as hell know who Lin-Manuel Miranda is, especially after last night. Miranda is the hottest thing around at the moment, having written and currently starring in Hamilton, which won 11 Tony Awards last night, 3 of which went to him. Disney wisely jumped on the Miranda train early, presumably locking him up for Moana before Hamilton obsession really took off as well as signing him for the upcoming Mary Poppins sequel film alongside Emily Blunt. Miranda has showed immense songwriting talent between Hamilton and In the Heights, and collaborating with Opetaia Foa’i should allow them to capture the authenticity of Pacific Islands music. But don’t overlook Mancina, who arranged Elton John and Tim Rice’s songs for The Lion King, as well working on Tarzan and Brother Bear. He also composed the amazingly creative score for August Rush as well as creating one of my all-time favorite film soundtracks, Twister. 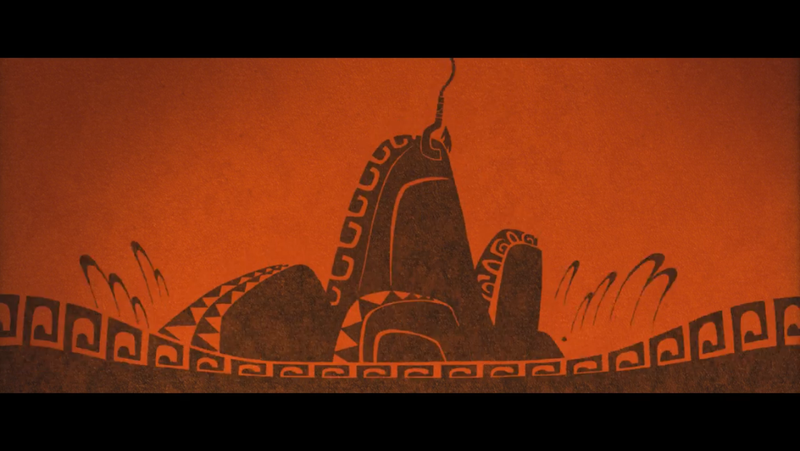 The next two shots are from an absolutely gorgeous sequence, the second that was shown at the Expo. 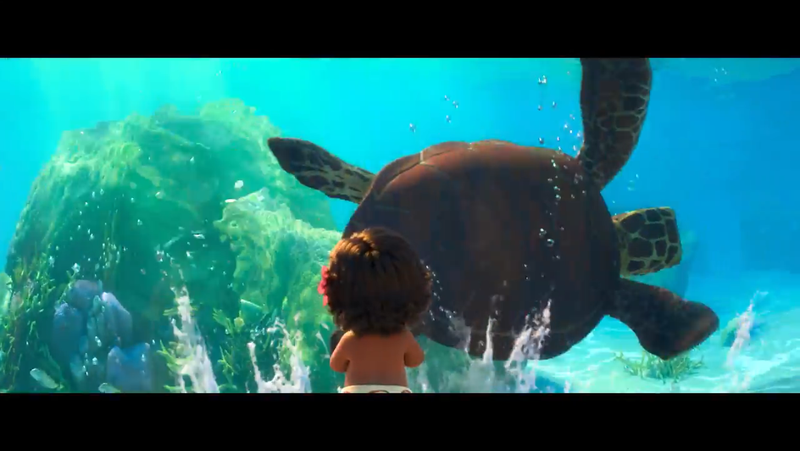 In the scene, a very young Moana is on the beach interacting with the ocean, which is a living character in the film. The ocean offers her a seashell, and as she comes closer it starts to lure her down the sand and into the water, which slowly recedes and forms a wall around her, allowing her a look into its depths. The ocean clearly feels a connection to the young girl, who is only a couple years old in the scene, and it interacts with her, waving at her with watery tendrils and reaching out to mess up her hair. She watches the undersea life swim past her until someone calls her name from the shore and the ocean quickly picks her up and sets her back on the dry sand (fixing her hair before returning back to normal). 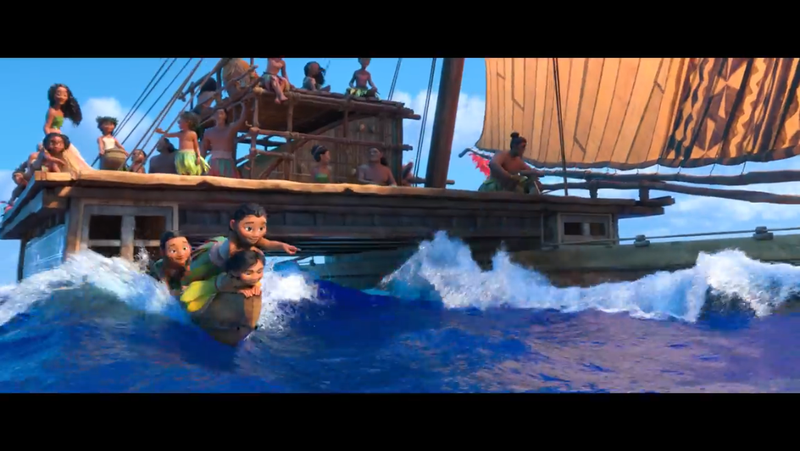 I’m really curious about the relationship between the sea and the woman Moana becomes, and how the living ocean will tie into the story. 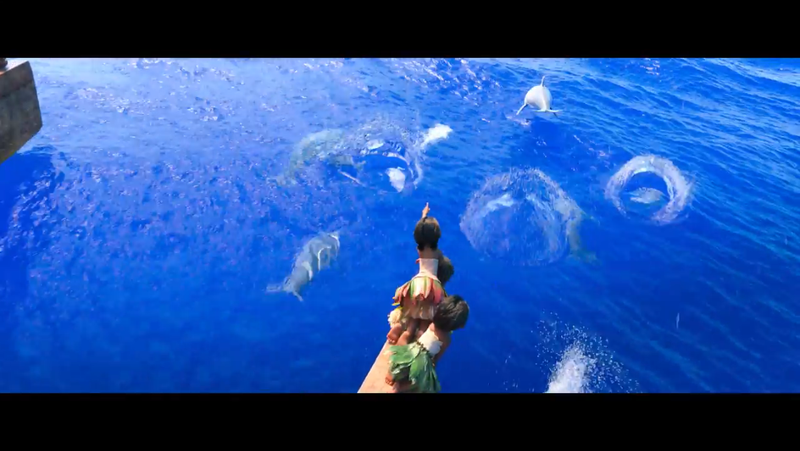 Among the new shots for the trailer we have this look at Moana’s family sailing together on a catamaran as dolphins swim alongside. 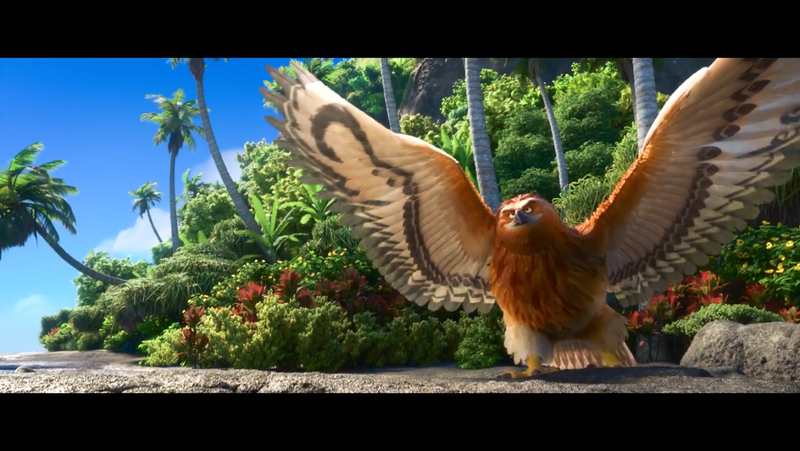 Maui also has the ability to transform into a raptor of some sort. 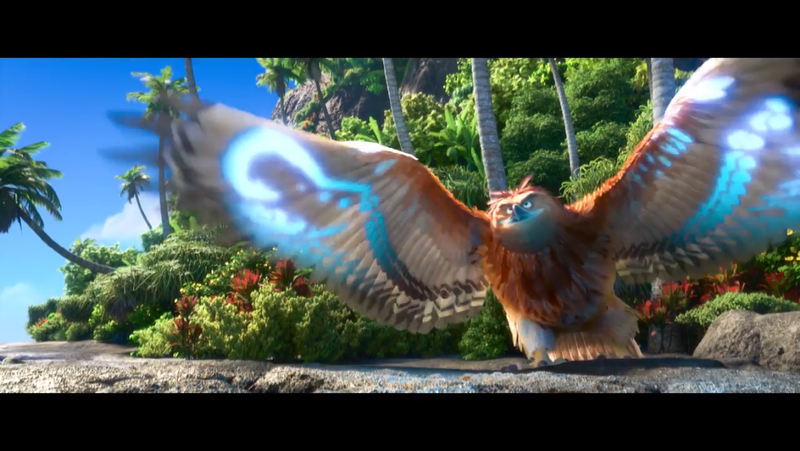 Not entirely sure if this is a specific species of bird (though, like all movies featuring any sort of raptor, they used the sound of a red-tailed hawk), but given Maui’s magical powers it could be something unique. 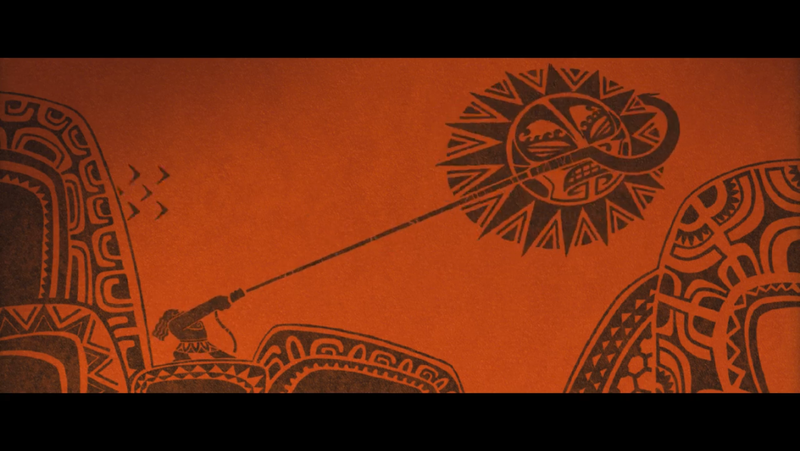 We get the film’s title/logo, and then one look at another character from the film, Hei Hei, a rooster. 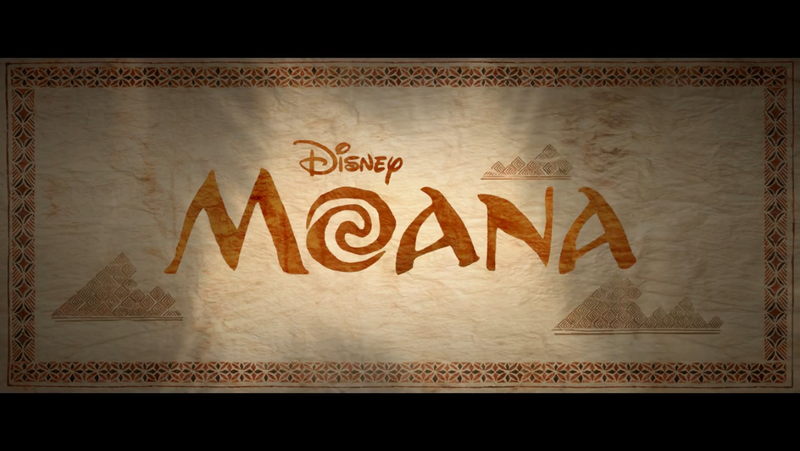 Moana is directed by Ron Clements and John Musker, who also gave us The Little Mermaid, Aladdin, Hercules, and The Princess and the Frog, and are one of the many reasons I’m most excited for Moana. They’ve definitely proven they know how to tell an animated musical story, and I can’t wait to see what they can do with computer animation. 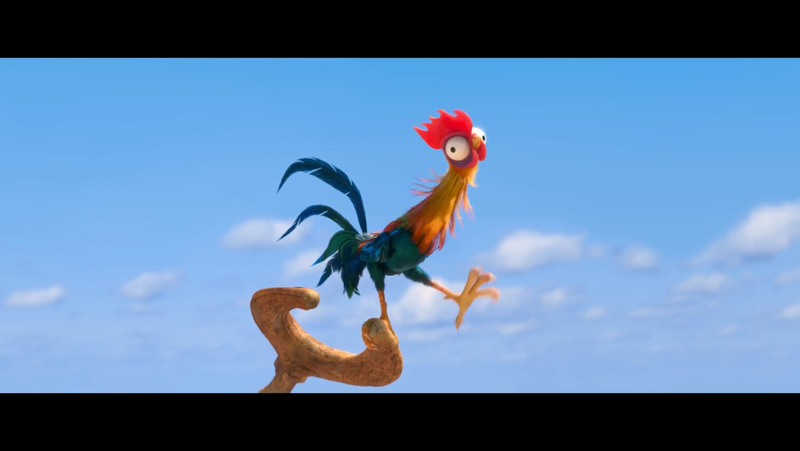 And at the D23 Expo they hinted that Hei Hei was modeled after Musker and Pua the pig was modeled after Clements. 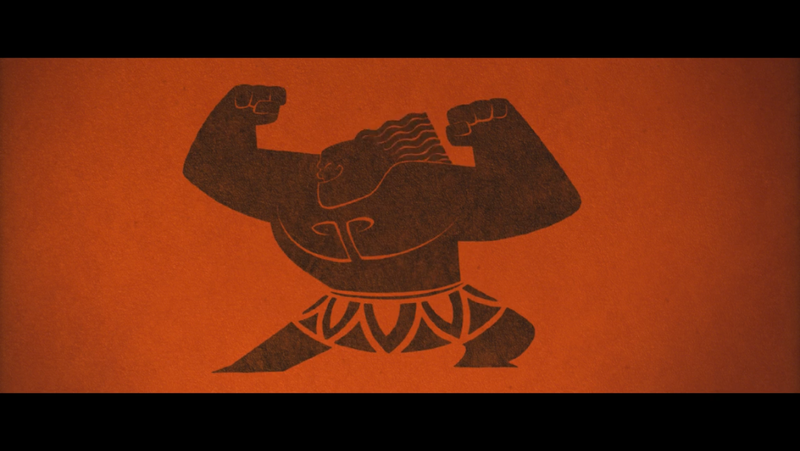 We’re still 5 months away from Moana’s release, and there’s still a lot we don’t know. 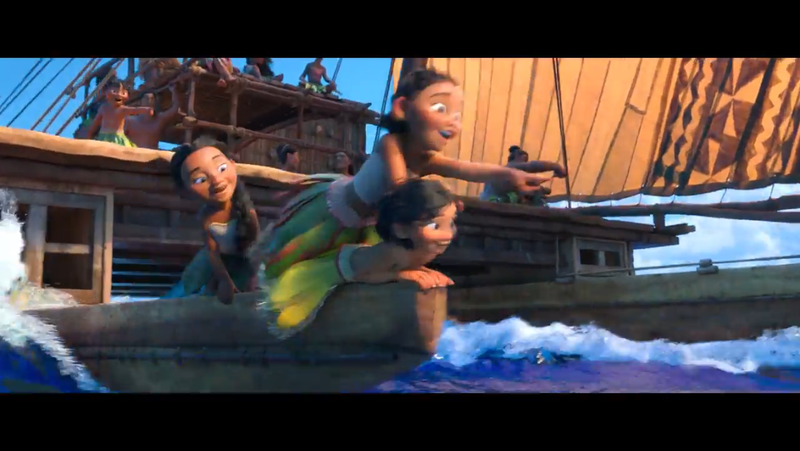 We know that Moana will be on a quest for a fabled island, hoping to explore the sea the way her ancestors once did but which her people have abandoned. We know her father doesn’t approve, but she sets out on her own anyway after the death of her grandmother. We’ve only gotten a small taste of the songs, which surely will be one of the most talked about aspects of the film in the lead-up to its debut. And we still haven’t heard anything from our titular heroine. 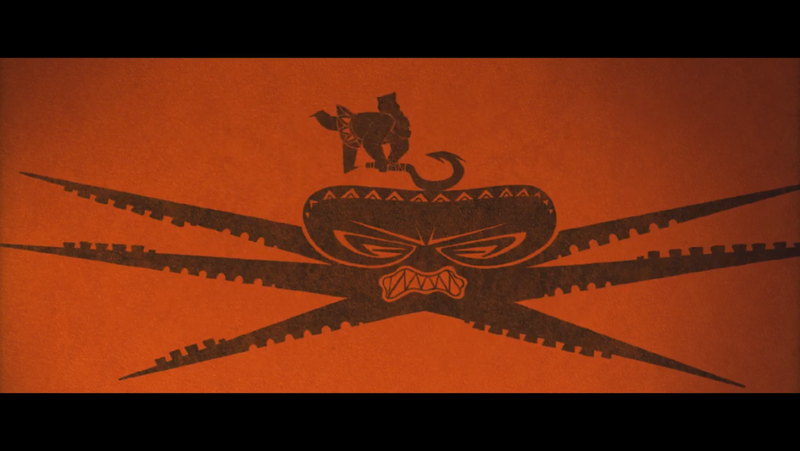 Still, I can’t wait to see more of Moana. There’s a huge amount of talent behind the film, from production to direction to music to acting, and it looks absolutely gorgeous. 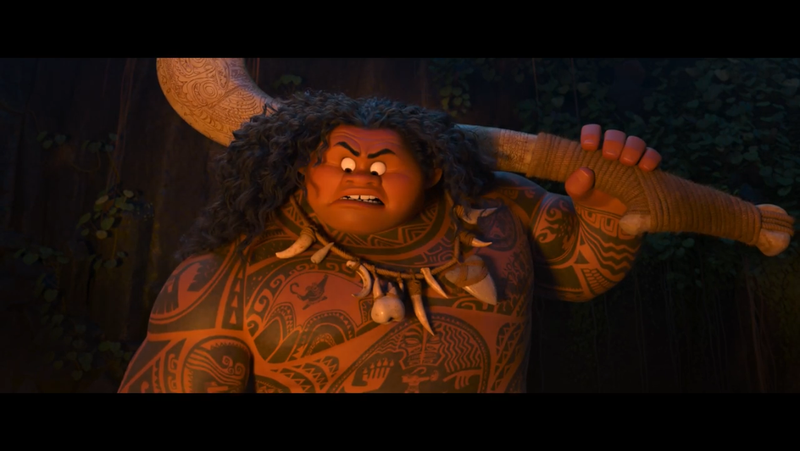 It’ll be hard to top Zootopia, which was fresh, modern, topical, and fun exploration of serious issues, but Moana looks different enough to stand out. Of course, comparisons to Frozen are bound to come eventually, but for now I’m just happy we’re getting a new animated hero of color, in a film with actors who are actually a part of the culture it represents. 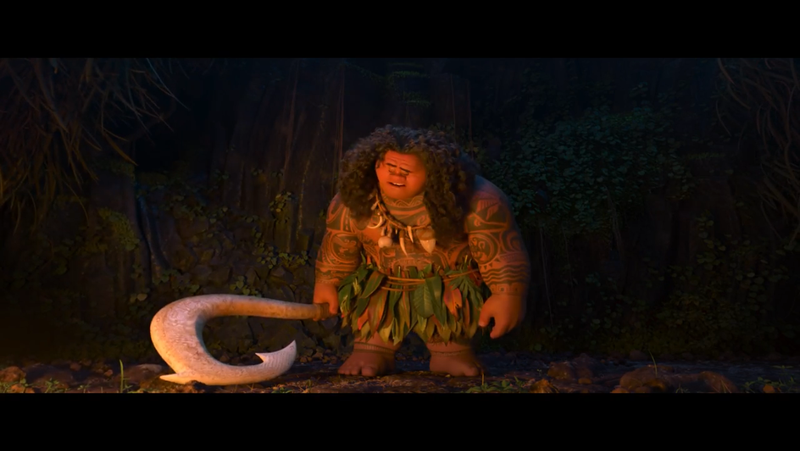 I’m sure Moana will be a lot of fun, with memorable music and characters as well as the trademark Disney heart, but representation and diversity are just as important. What do you think? 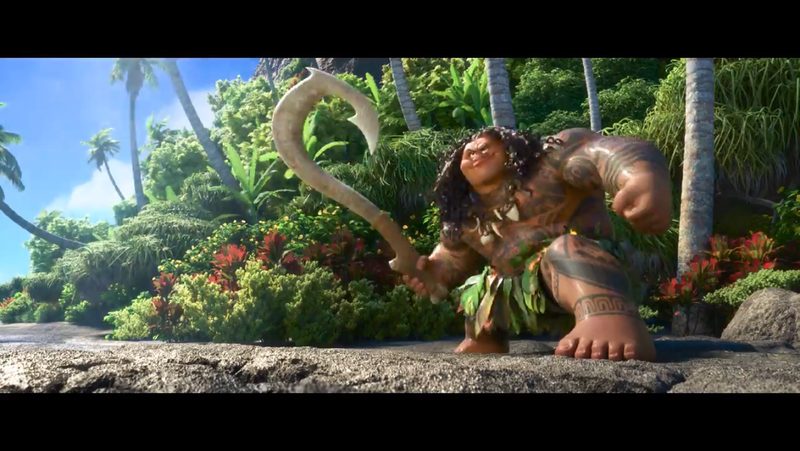 Did you like this first teaser trailer for Moana? Do you want to see more? What do you think of the visual style? Do you like the casting of Dwayne Johnson? How excited are you to hear songs from Lin-Manuel Miranda? Are you happy Eric Goldberg will be a part of the animation? 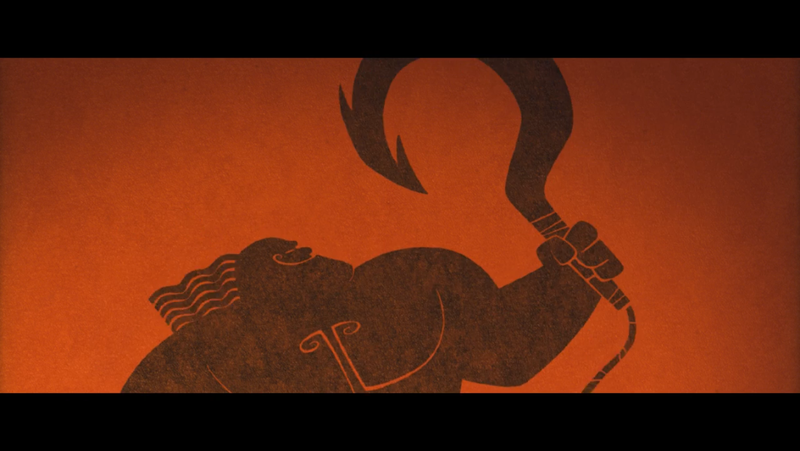 Is it nice to finally get another film from Ron Clements and John Musker? Has it really been seven years since The Princess and the Frog? Did the trailer help cheer you up after a horrible day like it did for me? What do you want to see from the next trailer? Let me know in the comments! 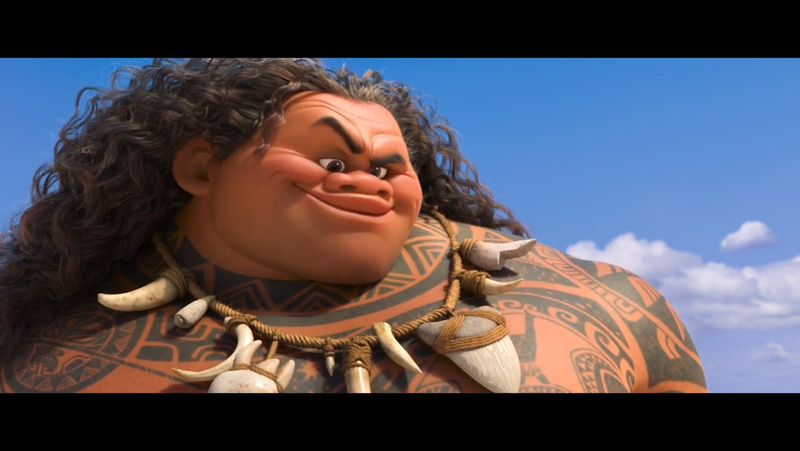 This entry was posted in Trailers and tagged auli'i cravalho, Disney, dwayne johnson, lin-manuel maranda, maui, moana, Trailers by lovepirate77. Bookmark the permalink. I’m really excited for this much more than I was before and think it’ll be an enjoyable addition to the canon! I too loved the pig! I also wish we knew more about the film and more characters. When do you think we’ll get the full official trailer? I was excited before, but I’m almost always excited. But this definite upped the excitement level! I would bet we’ll get another, longer trailer near the end of August. But we might get one a little earlier if they attach it to Pete’s Dragon. On that note, how do you feel about the Pete’s Dragon remake? I know you’ve generally been positive about the live-action remakes of the animated films, but what about this Pete’s Dragon remake? I actually don’t have much of an opinion on Pete’s Dragon. I’m in favor of the remake attempt on general principles (I really should finish the post I started about the remake trend a couple weeks ago), and I think Pete’s Dragon is a film with a lot to gain from an update. But I was never a big fan of the original. I thought the plot was pretty silly (not the invisible/imaginary dragon part of the story, but everything else), I didn’t care for the songs, and the only thing I really liked was the design of Elliot. I think it’s very dated, and could benefit from a new take on it. But what do you think? We’re getting a new trailer tomorrow, I believe. I too am not a fan of the original and felt it failed as a musical. So when I heard that this one was not going to be a musical, I was kinda happy for I felt maybe this could be a much superior film. I had no problems with this film being remade. But from what we’ve seen so far from trailers and posters, I’m incredibly disappointed and feel that this film may even be worse than the original. But, let’s hope not! I’m glad I’m not the only one who isn’t a fan of the original! What specifically has been disappointing to you about the new one? One, I hate the furry design of the dragon. Two, the teaser trailer just seems…boring, you’d think a movie involving a giant dragon would have more of a thrill/fantasy aspect to it. Granted this was just the teaser trailer though. Yeah, I’m gonna go watch the new trailer now. Ugh, I am so jealous that you got to hear the full version of that song. I haven’t been able to get it out of my head since the trailer premiered. And it’s only 20 seconds! 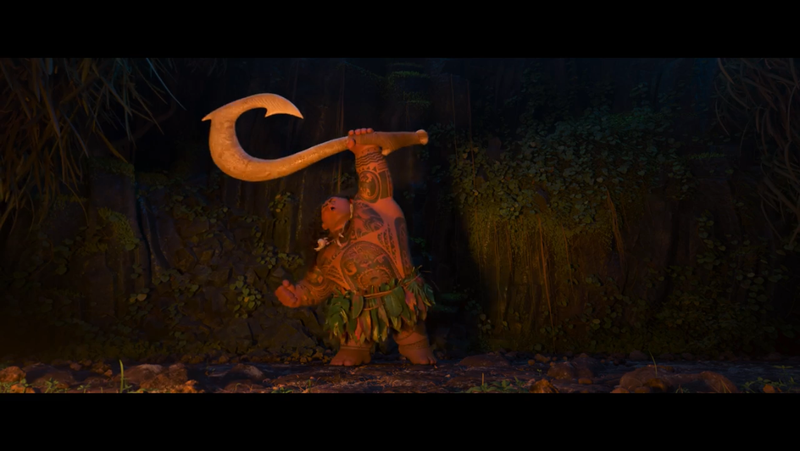 I’m psyched for Moana! 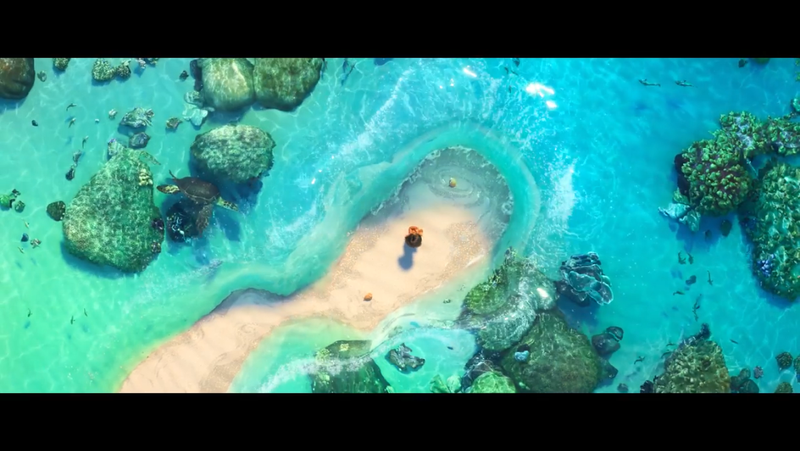 It easily looks like the greatest animated film of this year with that ocean animation alone. Now that you mention Eric Goldberg, I’m certainly excited for the characters especially since Maui seems like a Genie figure himself. 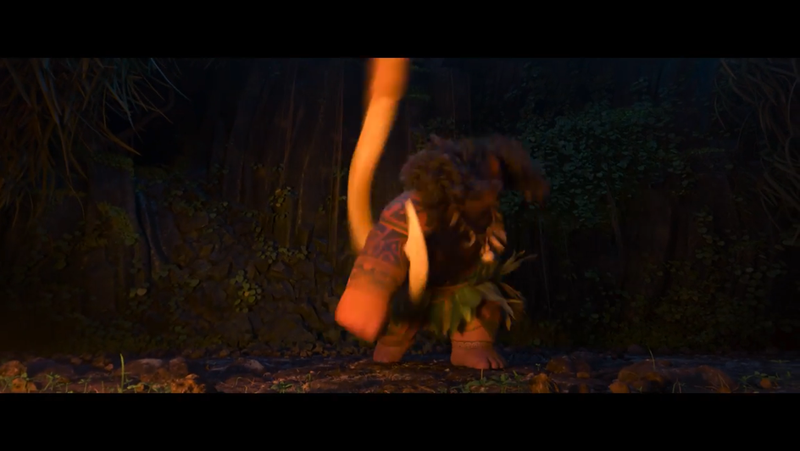 I can tell that this is just a teaser, but that just makes me more excited for more promotion to get a taste of Auli’i Cravalho who will undoubtedly get a fantastic solo for herself. Perhaps this might be Lin-Manuel Miranda’s chance for an EGOT? Honestly I wish I remembered the performance better. It was a beautiful song, but by that point I was so overwhelmed and emotionally drained by the first day of the expo that it’s all kind of a blur. And the sound wasn’t good enough to catch many of the lyrics very clearly. 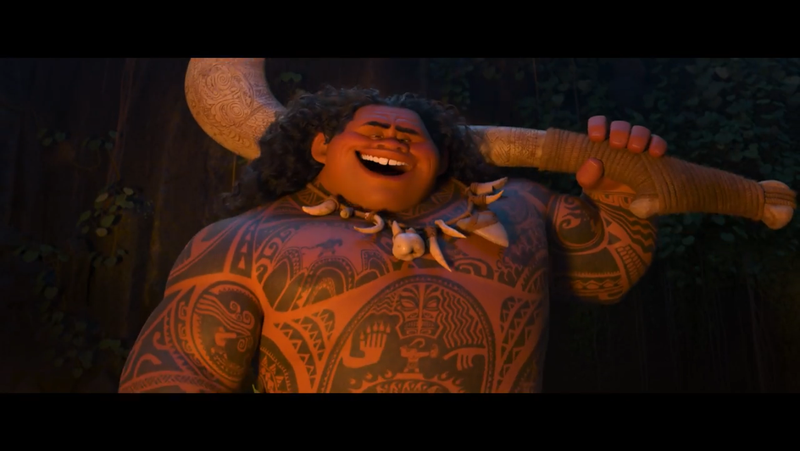 I know several people who don’t think it’ll be able to live up to Zootopia, but as great as that was I have high hopes that Moana will surpass it. 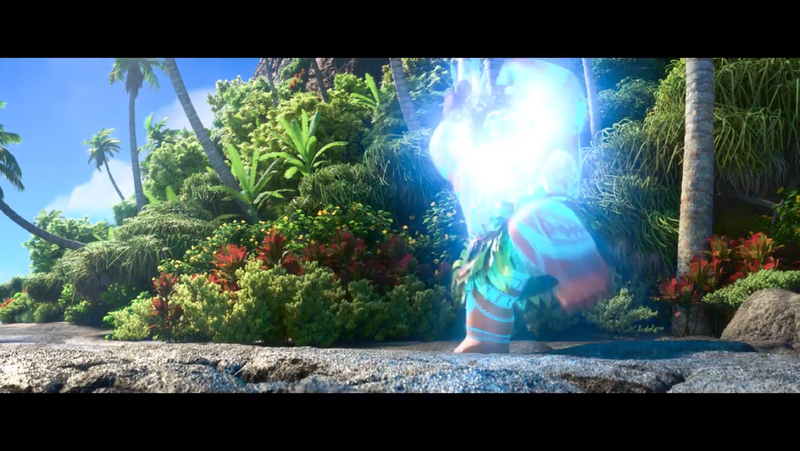 You’re right that Maui definitely has a Genie-esque feel to him. I can’t wait to hear Auli’i Cravalho sing, and to hear what Lin-Manuel has written for her! I definitely think he’ll get an Oscar nomination and maybe even be able to cross the “O” off the list (have to see his competition to know for sure). Now if only someone could rope him into doing something for TV he’d be able to get the “E” and have a full set! Did you watch the Tonys? Honestly, I do believe Moana has the chance to surpass Zootopia with its more iconic Disney qualities such as being a musical. Even if it doesn’t necessarily surpass Zootopia (which is admittedly a tall order since it passed $1 billion), that doesn’t mean it won’t be a good movie. Plus, I think the expertise behind it as well as its indulgence into the South Pacific culture will mean a lot to the audience. I can at least see it being well-received. I did see the Tonys! It was fantastic! There may be a time for him to win for his performance that night. But it may surprise you that Lin-Manuel Miranda already has an Emmy for his performance on the Tonys in 2014! All he needs is that Oscar, and being in a Disney movie is probably the best chance he could get. Oh crap, I totally forgot he had an Emmy! I’m sure he’ll get an Oscar at some point, though I’d love for him to get one for Moana! I personally don’t think Moana will quite match Zootopia at the box office or with the critics, though I bet it’ll be close. Disney “princess musicals” are still considered cliche and are derided in some segments, especially as a backlash against Frozen, so I think there will be group inclined to dislike it from the start. But regardless I think it’ll be great and will be a big success. I can’t wait!